Saying Goodbye to 2010 will be a catharsis for me and I will look back at the year with very mixed emotions. Carrying me along throughout the year were numerous moments of pure excellence in arts scene in the city of Düsseldorf, much of which I've been most fortunate to experience much of this up close and personal. Simply beyond amazing. A piece of passion, ripping farewell and beauty to remain with me always. 2. Simone Kermes at the robert schumann hall in museum kunst palast. A personality and voice to admire, what a thrilling performance! Cannot wait to see her again at the robert schumann hall in June 2011. KiKiFe, the Children's Film Festival, where we introduced the first International Children's Jury with ISR has left me with many wonderful memories. The students were such a delight, I am proud of the work they did and the magic we made. Buika and The Mozart Requiem from altstadtherbst stick in mind as does the extraordinary encounter at the concert given by Aki Takase at the Approximation Festival. This was such a passionate, unique concert and one I would never normally have visited had it not been for RhineBuzz. A true discovery. It was also a privilege to be able to talk about and admire the exquisite, porchelain-like portrait of Isabella Rosselini at the Mapplethorpe Retrospective at the NRW-Forum. Such a mesmerising woman we met at the NRW-Forum in 2009. Thanks are often boring to those not involved, so I'll apologise here and now. This is a an absolute must though as without the people who interact with us, RhineBuzz would be just another networking group and we all experience that, thankfully much, much more. So my heartfelt thanks go to Tanja Brill, Frau Jokel and Herr Schmiedel at the Deutsche Oper am Rhein. WoW! I'm in and out of The Opera House so often these days, now with three functions and I love each one equally. I knew when I took the first tour some 18 months ago, that I wanted to spend more time there and now, here we are! The press conferences are quite different from those of the fine arts. Less formal, somehow warmer. I recently told a close friend, an opera singer, that everyone is just so very nice! He answered it could be because all the staff are out there night after night, live and spontaneous interacting with their audience. Front and back stage. It's a real calling to wish to work there and boy do you sense this! I really mean it. I've not encountered huge egos, I'm always greeted with a genuine, warm smile, and my often naive questions are greeted with such enthusiasm. The Opera for All events and Opera Scouts project are aimed at bringing new people to the Opera and I'm privileged to be such a part of this. My knowledge of the Opera was so limited when I received their first call in December 2008, and now I just cannot imagine RhineBuzz without this institution of such history, passion and longevity. To Marina Schuster at museum kunst palast who welcomed me with the biggest smile and such a wonderful spark for all things new. Our Arts Sessions are just the BEST. We all love them so and they have introduced a very different aspect of the arts to many RhineBuzzers. Sabrina, our lovely instructor, thank you. Our continued partnership with mkp is a treasure, the exhibition halls are monumental and the robert schumann hall offers a fabulous musical program, especially for young people; I look forward to working even closer with you all in 2011. Adversely to Diva_Girl. Thank you for bringing us John and Herbert. Such great, great guys! Most of all to YOU, the RhineBuzz community. Each and every one of you who comes to our events, our readers and all of you who post and talk about RhineBuzz all over the place, spreading the word, helping others, especially the city newcomers, find a connection to us. You are such a diverse and enriching group of people. I'm so happy we have all found each other. To my precious friends who help where they can, despite madly busy careers and often rigorous travel. I'm very proud that RhineBuzz is not just about having a groovy time, as recent difficult situations have shown. When one of us needs help, we are all so willing to do what we can. A simple post brings in mountains of information. 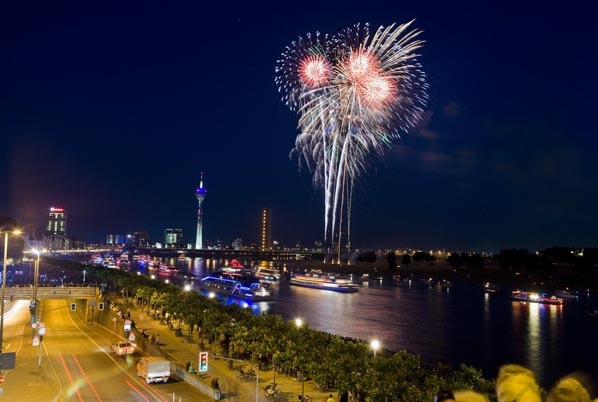 RhineBuzz is a trusted link to so many aspects in Düsseldorf, often when the formal connections are just too daunting to approach, or when family abroad are clueless as to how procedures work in Germany and need to fix things for their loved ones here. The community is quite simply brilliant. Thank you. Happy New Year to you all, all over the world! we miss you and love hearing what you are up to now. To those who have yet to discover us and this wonderful city, welcome. come back to us safely. 2011 will be simply brilliant! Roll on Eurovision! To quote a recent, very special post, "RhineBuzz flows!"